As often happens on Saturdays, the Emerging Runner family found themselves at the mall. It's always a tactical effort - go to a few targeted stores, locate what's needed and get out as soon as possible. Often my wife will head to the children's section to find items for the kids so I wander over to the men's area to see what they carry in terms of athletic wear. We were at Target and I was looking for pool shirts made with the type of fabric that doesn't disintegrate and bleach out from chlorine after three or so wearings. They didn't have those, only shorts, but they did have some nice shirts from their Champion G9 line. This stuff is very well priced and nicely designed. While the quality doesn't match the higher end stuff from companies like Brooks and Sugoui it's an excellent choice for daily training. I prefer to do my daily runs with lower end gear because it's cheap to replace when it gets worn out with multiple washings. I try not to wear my "premium"shirts (Zoot, Nike Sphere, Adidas adiSTAR) except to race or when heat conditions require a superior wicking shirt. I didn't buy any of the Champion G9 shirts but on a whim I checked out Old Navy's RECTECH performance shirts that were currently on sale. I often worry that when I run in the neighborhood or on the trails that I could get mowed down by an inattentive driver or mountain biker. 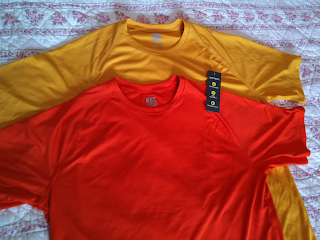 Most of my day to day running clothes are either black or white so when I saw short sleeved RECTECH shirts for $5 apiece I bought two, one pumpkin orange and the other mustard yellow. These wicking shirts seem nicely made and contain some stretchable material. Not bad for $5! I wore my orange shirt today over my other two layers (33 degrees at 8:30 AM) as I headed out for my morning run. The route I chose took me to neighborhood #2 which required a short segment running along a one way service road where people often speed. I was happy to have my orange shirt serving as a beacon to drivers. All the same I ran as close to the snow line as possible for the minute I was on that connecting road. I had a decent run overall, half in neighborhood #2 and the other half in my main neighborhood, totaling 4.7 miles. I'm still feeling some of the effects from my Thursday core exercises which means I need to do them more often. Although Monday is usually a rest day I plan to do the Lolo core routine to help strengthen some key muscles. I'm going to need all the help I can get if Sunday's race turns about to be a hilly run in the snow. Thanks for the Rechtech poitner, ill be looking for those 5 buck shirts!